Vanilla is the second costliest spice in the world, after saffron. 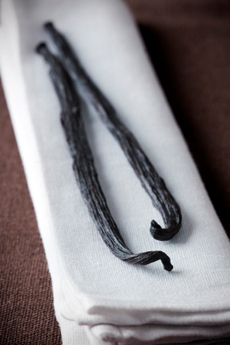 Photo of vanilla beans by Joan Vicent Canto | IST. This is Page 2b of a nine-page article. Click on the black links below to visit other pages. The seed pod or fruit of the vanilla orchid. Botanically, it is incorrect to call it a bean; it is a pod. Only two species are used for culinary purposes. The pods, or beans, are tasteless and odorless until they are boiled, cured, dried and rested. The vanilla bean is used directly in recipes—scalded in milk, cream or other liquid to provide vanilla flavor to ice cream, custard and other products. Beans look and taste slightly different, depending on where they are grown and how they are cured. From left to right, these beans are from Papua New Guinea, French Polynesia and Madagascar, respectively. Photo comparing Aust & Hachmann vanilla beans. All product photography by Claire Freierman | THE NIBBLE. The flavor extracted from a vanilla bean to produce vanilla extract. The essence is extracted from the bean in ethyl alcohol, where it becomes vanilla extract. Unfortunately, some producers of imitation vanilla refer to their products as vanilla essence, which is confusing. A natural vanilla product that is similar to vanilla extract but contains 2-3% alcohol or less; may also contain sugar and/or an FDA-approved polypropylene glycol base. 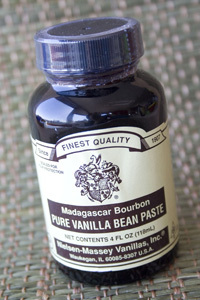 A concentrated substitute for vanilla extract in paste form, made from combining ground vanilla with vanilla extract, along with a natural thickening agent (a gum); some products contain sugar. Unlike vanilla extract, vanilla paste contains the seeds that provide “speck” to the appearance of the dish. It is a replacement for whole vanilla beans for people who want authentic vanilla bean flavor and appearance, but don’t use whole beans often enough (whole vanilla beans will dry out and become hard over time, while vanilla bean paste has a very long shelf life). One tablespoon of vanilla bean paste is equal to one whole vanilla bean. Nielsen-Massey’s Vanilla Bean Paste. Photography by Claire Freierman | THE NIBBLE. The orchid species from which most of the world’s vanilla is derived. The orchid shoots out seed pods, which are the “fruit” of the plant. After the pods are dried and cured, they become aromatic and flavorful. The flavor comes from the seeds inside the pod. See Vanilla Orchid, below. The plant originated in the area that is now southeast Mexico and Guatemala. “Vainilla” is a diminutive of the spanish word vaina, meaning pod or sheath. The genus name, planifolia, refers to the flat shape of the leaves. Vanilla means “little pod” in Spanish. The pod, also (incorrectly, from a botanical point of view) called the bean, is the edible fruit of the vanilla orchid. As you can see in the photo at right, it resembles a long green bean, which is why the term “bean” persists. Most of the fragrance of the pod, which emerges when the pod is cured, resides in the seeds and the oily liquid surrounding the seeds. The pod contains about 2% vanillin (which provides the aroma), 25% sugars, 15% fat, 15% to 30% cellulose, 6% minerals and 35% water. A third variety of bean, Vanilla pompona, originated in the West Indies and also grows Central and South America, but is not of top culinary quality. It is said to have a cherry-like aroma and is used primarily in perfume and non-food applications. 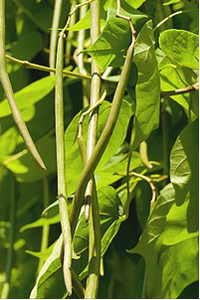 Instead of looking like green beans, the pods look like miniature, four-inch-long bananas. Photo of vanilla pods courtesy of Danish-Schnapps-recipes.com. The leaves in the photo are not the leaves of the vanilla orchid, but of the tree upon which the orchid vine is growing. A climbing orchid from the family Orichidaceae. When the fruit (pod) is cured, it is edible; among the 20,000 different species of orchids, only the Vanilla species bears an edible fruit. There are more than 50 species of vanilla orchid, but only three produce fruit that can be used commercially: Vanilla planifolia, Vanilla Pompona and Vanilla tahitensis. When growing wild, the thick green orchid vine of the orchid will climb up the tree trunks in the jungle. When grown commercially, however, they are pruned back—both to enable workers to pollinate and harvest them, and because the vines will not flower until they stop growing. The pollinated flower produces large green vanilla pods (called “beans”) that take about six months to reach maturity; then they are harvested and cured. See Vanilla planifolia. Vanilla orchids can be purchased from HostGardens.net. Vanilla powder is a combination of sugar (or dextrose) and ground vanilla or vanilla extract. It is used to flavor beverages. You can mix the powder with granulated or confectioner’s sugar to make vanilla sugar. 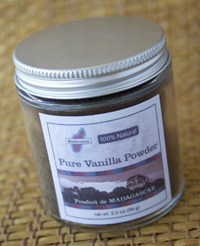 Pure Vanilla Powder from Madécasse. Photo by Claire Freierman | THE NIBBLE. 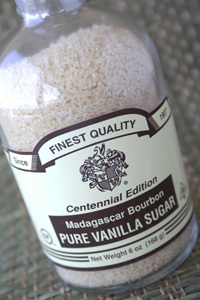 Pure Vanilla Sugar from Nielsen-Massey. Photo by Claire Freierman | THE NIBBLE. 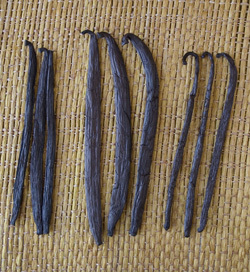 Vanilla tahitensis, Tahitian vanilla, is believed to be a hybrid of Vanilla planifolia and V. pomp ono.The beans are more fragrant and fruity when compared with Vanilla Planifolia. See Tahitian Vanilla. The most of prevalent of more than 250 flavor compounds in vanilla, that gives vanilla its characteristic flavor. The fermented pod contains about 2% vanillin, depending on the species and its provenance. Crystallized vanillin may be visible on the surface of exceptionally fine pods, in the form of tiny white needles called givre, the French word for frost). Synthetic vanillin is manufactured for artificial vanilla products.